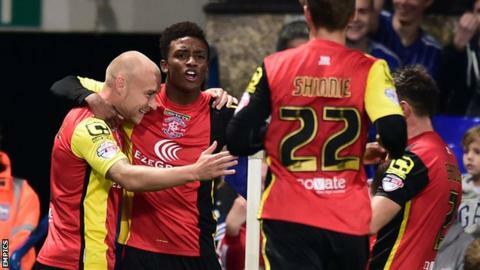 Ipswich Town fought back to earn a draw with Birmingham City, thanks to a controversial Brett Pitman penalty. David Cotterill fired the visitors ahead after a slip by Christophe Berra. But Pitman levelled from the spot after referee Keith Stroud ruled Jonathan Spector had fouled Ainsley Maitland-Niles as he slid in to block a cross. Maitland-Niles and Luke Chambers both sliced good chances wide for Ipswich, while substitute Daryl Murphy steered a free header off target. But the big talking point of the game was Ipswich's spot-kick, which came 10 minutes after Cotterill had fired Birmingham in front from 15 yards, Andrew Shinnie having capitalised on Berra's slip to play him in. Maitland-Niles showed great pace to get to the byline but his cross took a deflection off Spector and dribbled into the arms of keeper Tomasz Kuszczak. However, as Spector slid in, his follow-through saw him collide with Maitland-Niles and referee Stroud chose to point to the spot. Ipswich, who would have gone second if they had won, had the better of the second-half chances but could not find a way through. Freddie Sears saw a shot cleared off the line by Stephen Gleeson, before Chambers side-footed wide from a corner. Maitland-Niles also sliced wide from substitute David McGoldrick's knockdown, while another substitute Murphy planted a free header off target. Birmingham, who climbed to sixth with their point, almost snatched all three points at the end when Gleeson curled wide from the edge of the box following Cotterill's short free-kick. "I did think it was a strange decision when I first saw it, but looking at it after the game I think the referee has got it right. "Harsh as it may seem to them (Birmingham), it was the momentum that caused the foul. If it had been outside the box or on the half-way line, the foul would have been given. It shouldn't be any different in the area." "I'm disappointed because I think everyone I've spoken to says there was no way it was a penalty. At the end of the day the referee's got to give his decision, but he's 60 yards away, his assistant is 20 yards away, nobody appeals and yet he gives it. "To lose a goal lead in that manner made the game incredibly hard but we stuck at it and we really defended well in the second half under a lot of pressure. "I think that's probably as big a result for us as any this season because of the manner of the place, the journey and Tuesday night's game [against Nottingham Forest]." Attempt blocked. Jacques Maghoma (Birmingham City) right footed shot from the left side of the box is blocked. Offside, Ipswich Town. Freddie Sears tries a through ball, but Daryl Murphy is caught offside. Attempt saved. Ryan Fraser (Ipswich Town) left footed shot from the left side of the box is saved in the centre of the goal. Assisted by Daryl Murphy. Corner, Ipswich Town. Conceded by Stephen Gleeson. Attempt blocked. Cole Skuse (Ipswich Town) right footed shot from outside the box is blocked. Assisted by David McGoldrick. Attempt missed. David McGoldrick (Ipswich Town) right footed shot from the right side of the box misses to the left. Assisted by Daryl Murphy with a headed pass. Paul Robinson (Birmingham City) wins a free kick in the defensive half. Attempt missed. Stephen Gleeson (Birmingham City) right footed shot from outside the box is close, but misses to the right. Assisted by David Cotterill following a set piece situation. Substitution, Birmingham City. Paul Robinson replaces Demarai Gray. Attempt blocked. Freddie Sears (Ipswich Town) right footed shot from outside the box is blocked. Assisted by David McGoldrick. Attempt missed. Daryl Murphy (Ipswich Town) header from very close range is close, but misses the top right corner. Assisted by Ryan Fraser with a cross following a corner. Corner, Ipswich Town. Conceded by Tomasz Kuszczak. Corner, Ipswich Town. Conceded by Jonathan Grounds. Substitution, Birmingham City. Jacques Maghoma replaces Andrew Shinnie. Attempt missed. Ainsley Maitland-Niles (Ipswich Town) left footed shot from the centre of the box misses to the left. Assisted by David McGoldrick with a headed pass. Substitution, Ipswich Town. David McGoldrick replaces Larsen Touré. Attempt missed. Luke Chambers (Ipswich Town) left footed shot from the centre of the box misses to the right. Assisted by Christophe Berra with a headed pass following a corner. Corner, Ipswich Town. Conceded by Maikel Kieftenbeld. Attempt blocked. Demarai Gray (Birmingham City) left footed shot from the centre of the box is blocked. Substitution, Ipswich Town. Daryl Murphy replaces Brett Pitman. David Cotterill (Birmingham City) wins a free kick in the defensive half. Foul by Brett Pitman (Ipswich Town). Attempt blocked. Clayton Donaldson (Birmingham City) left footed shot from the centre of the box is blocked. Assisted by Michael Morrison. Attempt missed. Brett Pitman (Ipswich Town) header from the centre of the box misses to the left. Assisted by Larsen Touré following a corner. Brett Pitman (Ipswich Town) wins a free kick in the attacking half. Offside, Birmingham City. Maikel Kieftenbeld tries a through ball, but Clayton Donaldson is caught offside. Jonathan Douglas (Ipswich Town) is shown the yellow card for a bad foul. Andrew Shinnie (Birmingham City) wins a free kick in the defensive half.